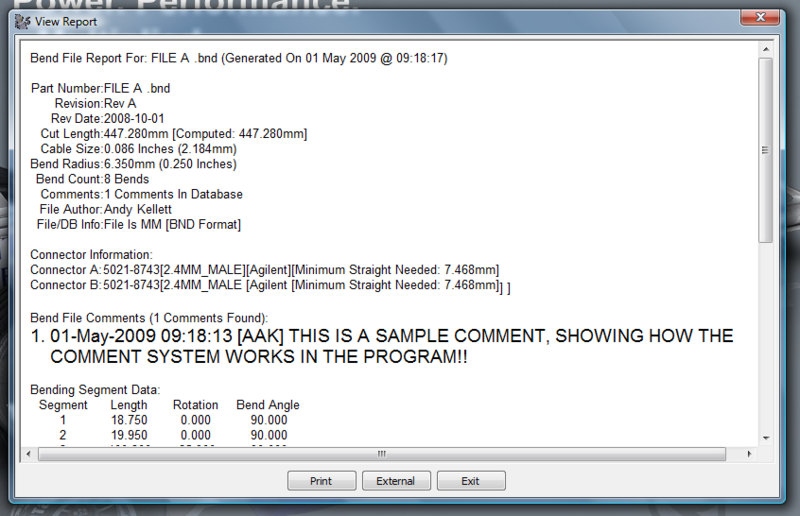 Bend File Printer is a simple tool I started writing back in 2006 to help my company with producing efficient cable designs. To learn more about the history of the program, take a look at Bend File Printer History. You can download a presentation of this program in PDF format from Here (840Kb). 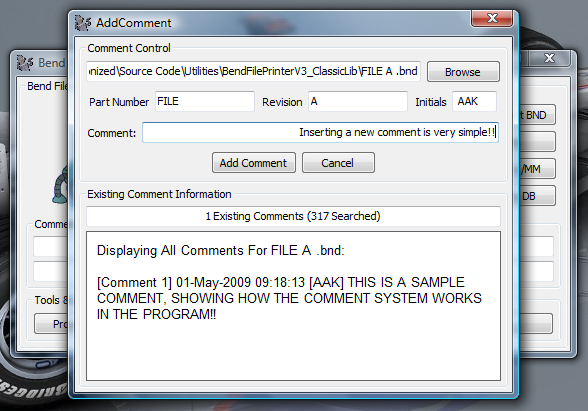 Some portions of this code also appear in FlexIO. 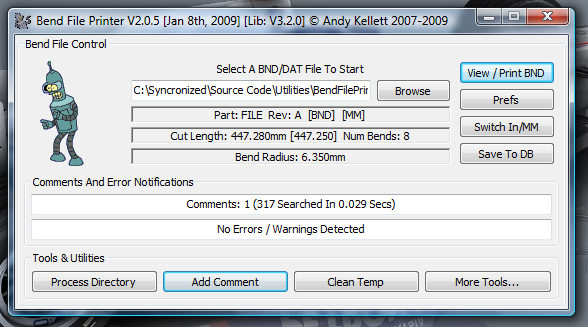 Bend File Printer is a small tool I wrote to assist me with cable design & manufacturing at work. It started off as a very small and simple application, and over the years has evolved into a very useful & innovative engineering tool (see Here for some history on the program). 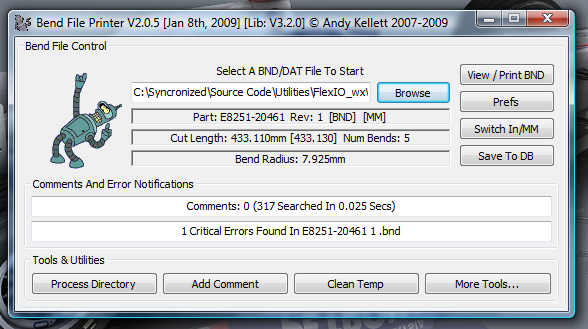 The tool will analyze BND / DAT / FLX files and report any problems, issues or warnings. It also produces a printable report detailing the entire cable design including connector & cut length information, which is then attached to cable work orders before they hit the production floor. The tool has saved many hours of un-necessary work, as well as saving thousands of feet of waste cable by being able to detect major issues before a single piece is even cut. Engineers can correct the most common cable design errors at their desk, without having to worry about running into an issue after the cable has been cut and partially built! The application was originally intended for my own personal use, but as more people saw and used it at the job, it quickly became something much more powerful. I hope one day to be license it to other people for use. 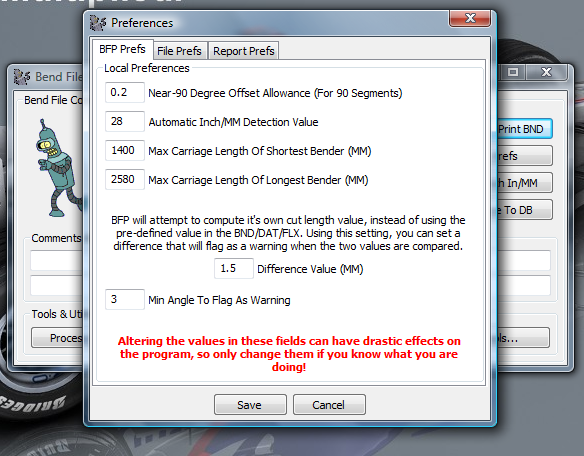 Fully intuitive GUI makes navigating around the program and it’s preferences very simple. Automatic line ending conversion, so the file doesn’t have to have to be saved in Windows or Unix format in order to work, it will just convert as needed. Improved BND Comparison – Compare two BND files side by side and display their differences in a report file that can be printed. LRA Conversion from BND Coordinates – Convert the XYZ tables within a BND file directly to Length/Angle/Rotation values, without having to rely on the CableAdvisor to do the conversion for you. This will increase all accuracy to 6 decimal points (from 2 in the CableAdvisor). 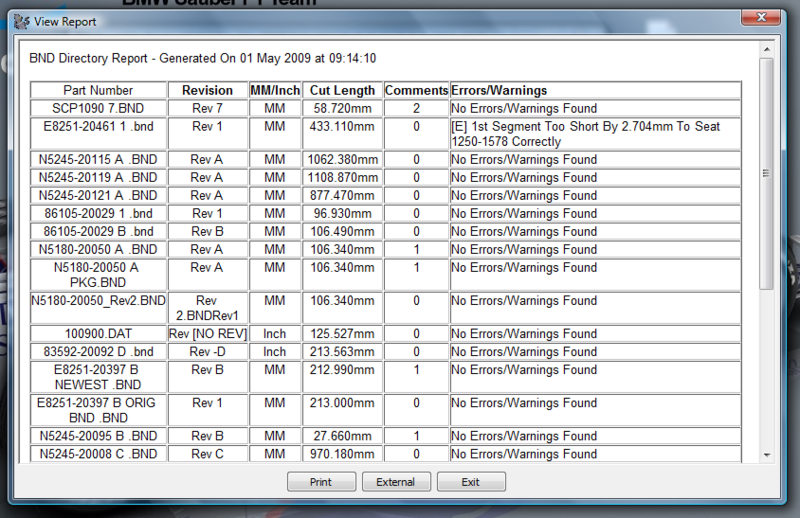 I’d also like to add conversion from other formats, such as Eaton Leonard and Pipe Data from tools such as Pro Engineer. Direct STEP/IGES Calculation – Import a STEP/IGES model of a piece of a cable design, and convert it directly to LRA values, or XYZ points. This will make modelling of 3rd party cables a snap. Real-Time Cable Preview – See a preview of the designed shape in 3D before it’s bent. Tweak your angles and rotations in realtime! If you have any additional questions about this, or any of my programs, feel free to contact me via email at fishguy8765 [at] gmail.com or use the comments section of this page. Thanks!